PPAO officials on the evening of February 5 took part at the closing ceremony of the 15th Southern Or Bor Jor Cup (Pingkan Games) at Phang-Nga Stadium. Chaired by Phang-Nga governor Prayoon Rattanasenee, the ceremony was attended by representatives from 14 southern provincial administrative offices as well as those from Prachuap Khirikhan province. 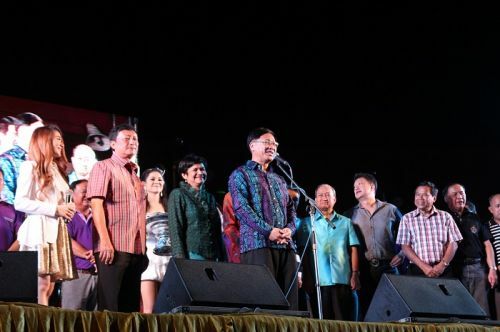 Representing Phang-Nga Provincial Administrative Office was its president Bamrung Piyanamwanit, who was accompanied by his executives and council members. Representing PPAO were Chief Administrator Watcharin Pathomwattanapong who led a team of officers and council members. The Southern Or Bor Jor Cup, the 15th of its kind, was a sports event participated by provincial administrative officers from all southern provinces including Prachuap Khiri Khan. Taken place in Phang-Nga from January 29 – February 5, 2015, the event was called Pingkan Games. PPAO team proudly won two gold medals in football and sepak takraw, two silvers in 200-m sprint (female 30-39 years) and 200-m sprint (male, 50-59 years); and five bronzes in 8×50 m relay (male, 30-39 years), 100-m sprint (male, 30-39 years), 400-m sprint (female, 30-39 years), 4×100 relay (male, 40-49 years) and 4×100 relay (male 40-49 years). Altogether, nine medals were awarded to PPAO.